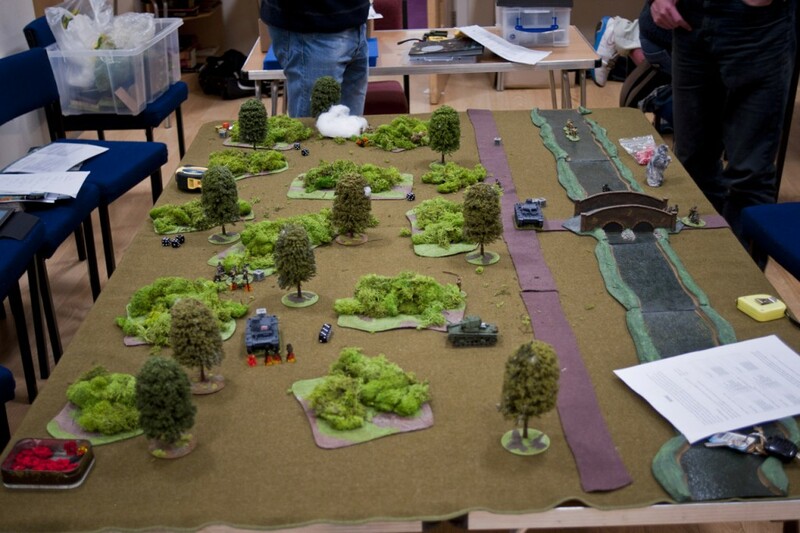 The Scenario is designed for the 28mm Wargame Bolt action (but could be played for any ruleset!) 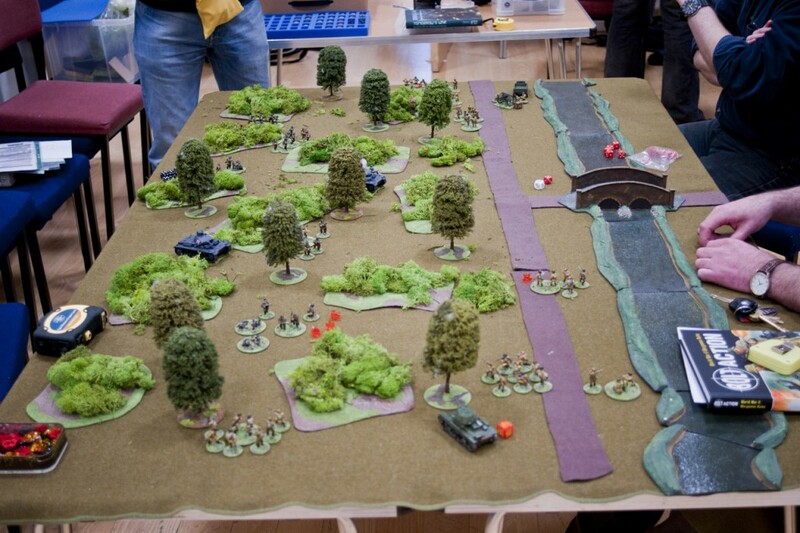 and is set on the eastern front in the early part of world war two (no specifics). 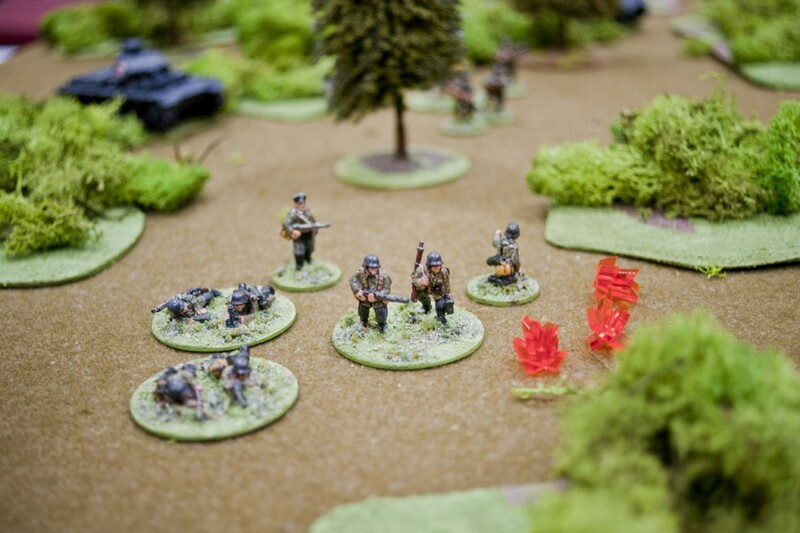 A German attempt to break through the Soviet lines has met heavy resistance and forced the German army to retreat back to their own lines. 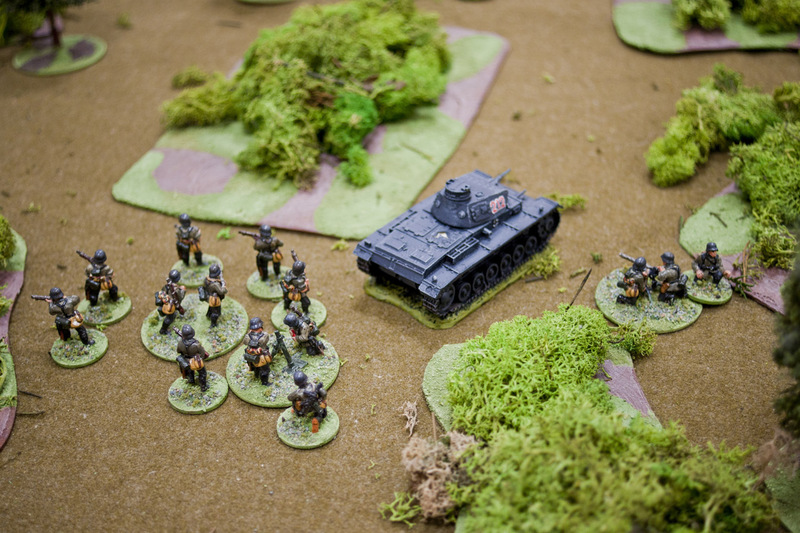 Soviet forces are pursuing the retreating Germans and are making an attempt to cut them off before they can escape to safety. An attempt to break through the Russian lines to the east met with heavy resistance and a ferocious counter attack with heavy tanks. 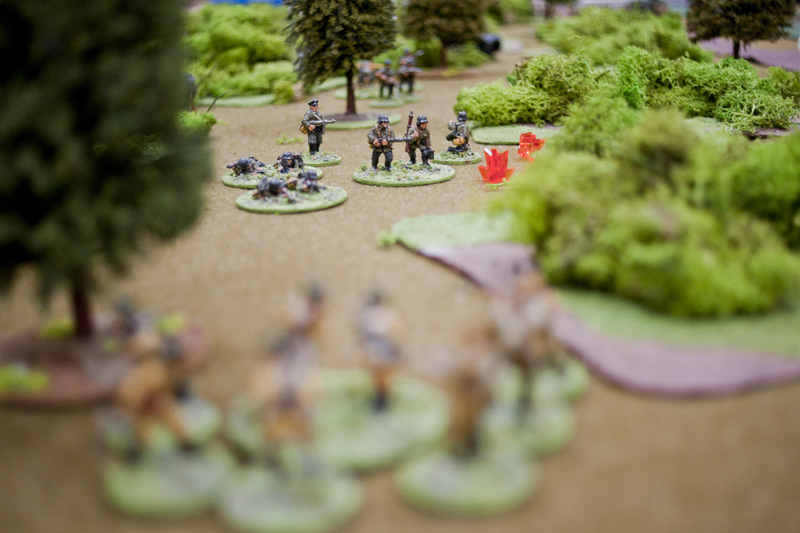 The division commander called off the attack and you are now hastily making your way back to your own lines. 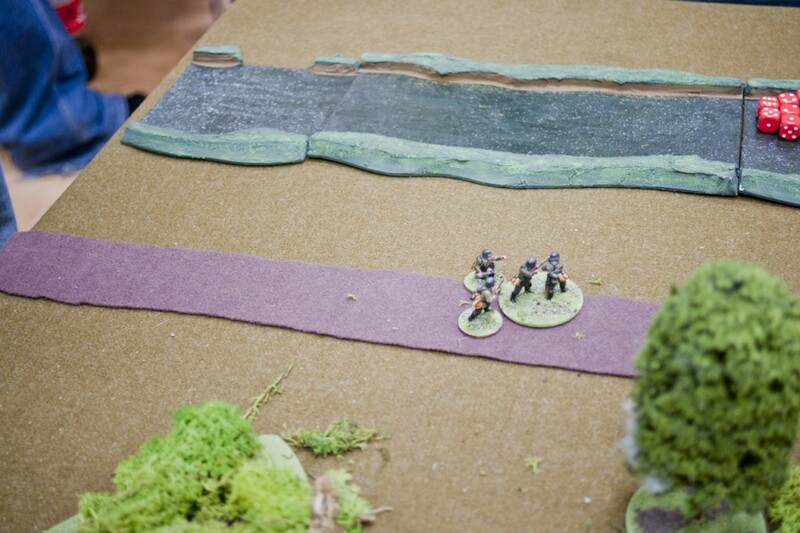 You managed to elude close pursuit by heading into the thick forest the other side of which is a small river crossing. If you can get over the crossing safely you should be able to get back to your own lines easily. You have picked up straggling units on your retreat including a mortar squad and a couple of panzer III. 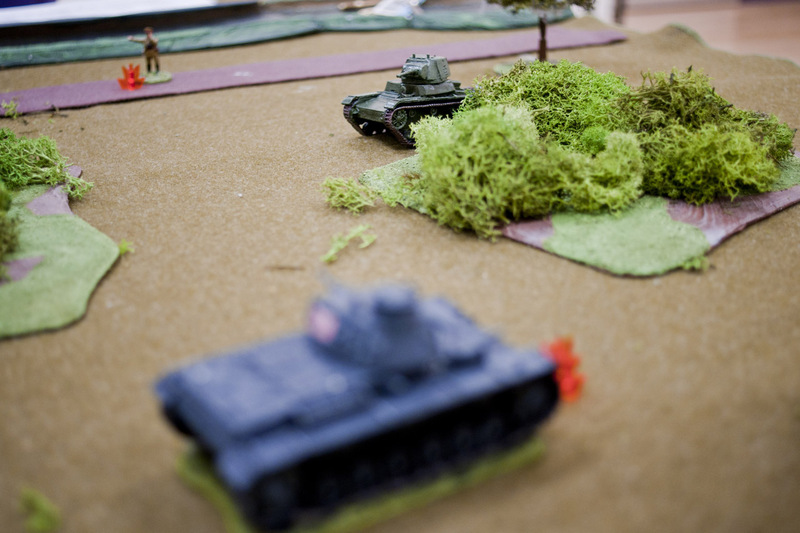 It is of critical importance that the heave equipment gets back to your lines quickly for the counter attack. You can hear the pursuit behind you… but how far behind you can’t tell. 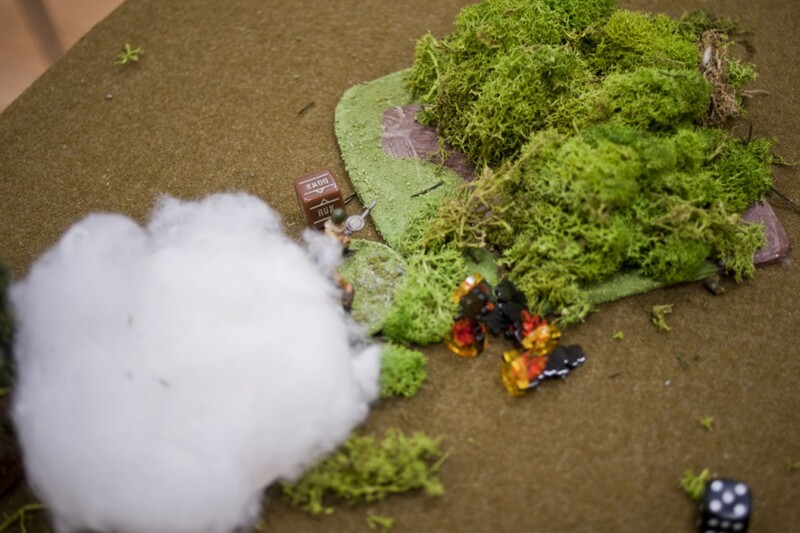 At least they must be having as hard a time as you are negotiating this dense forest. 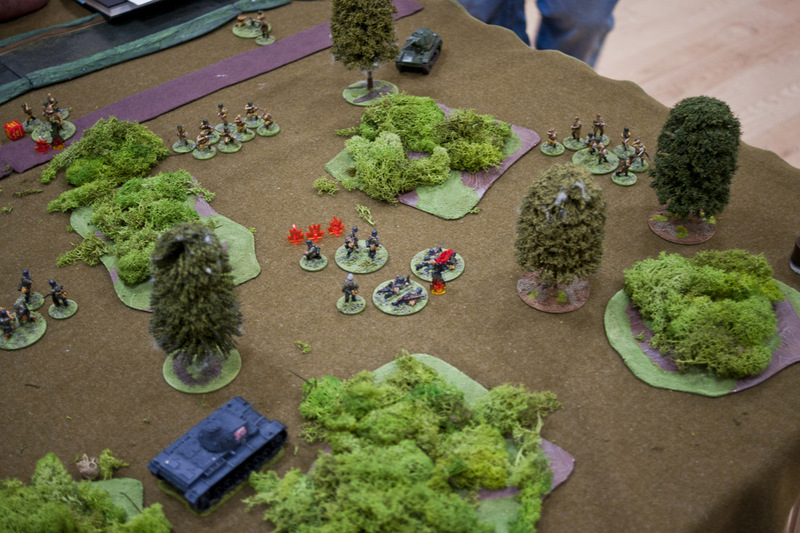 German player starts with 9 units and 15 order dice in the bag. 1x Black die in the orders bag. 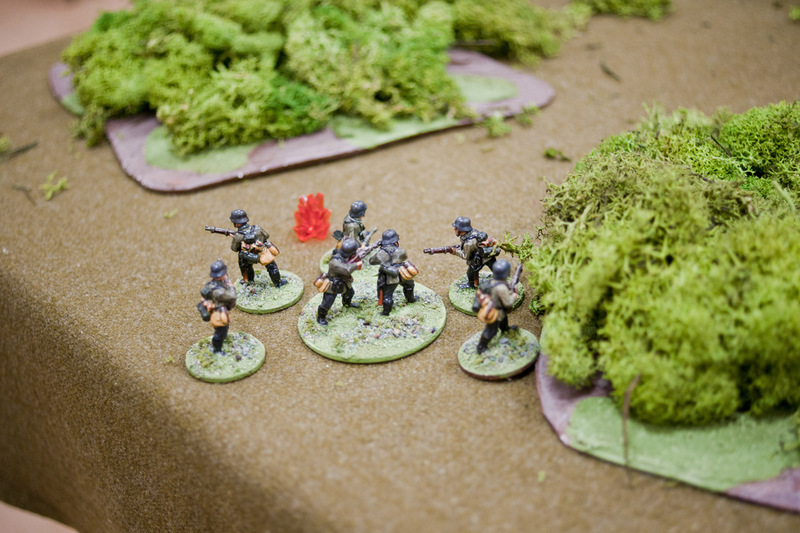 This represents a spotter from the pursuing soviet force getting sight on one of the escaping german units. 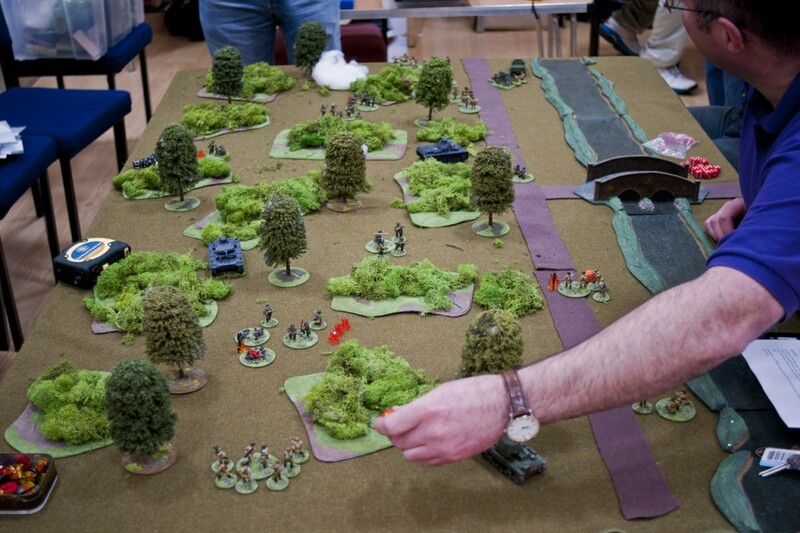 A shot can be taken at any unit visible from any point on the eastern table edge. Counts as medium howitzer, with range measured along the line of sight from the table edge. 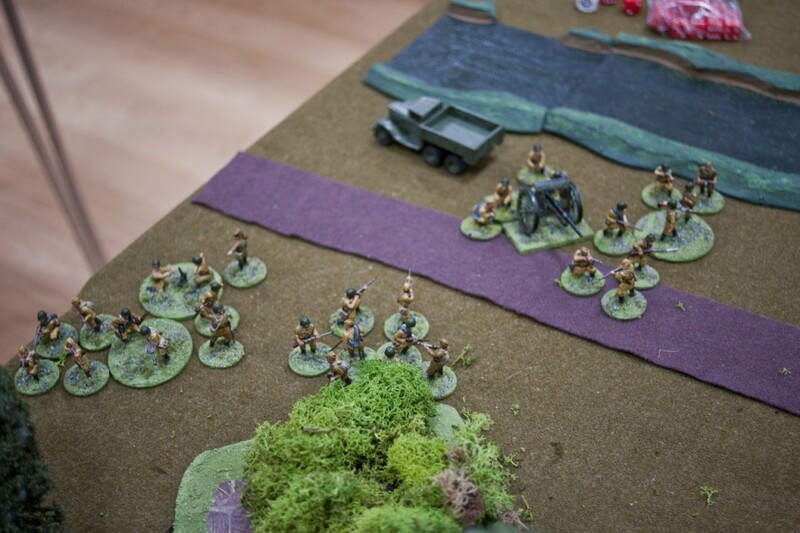 Soviet platoons use different coloured orders dice to represent lack of shared command control/radio. 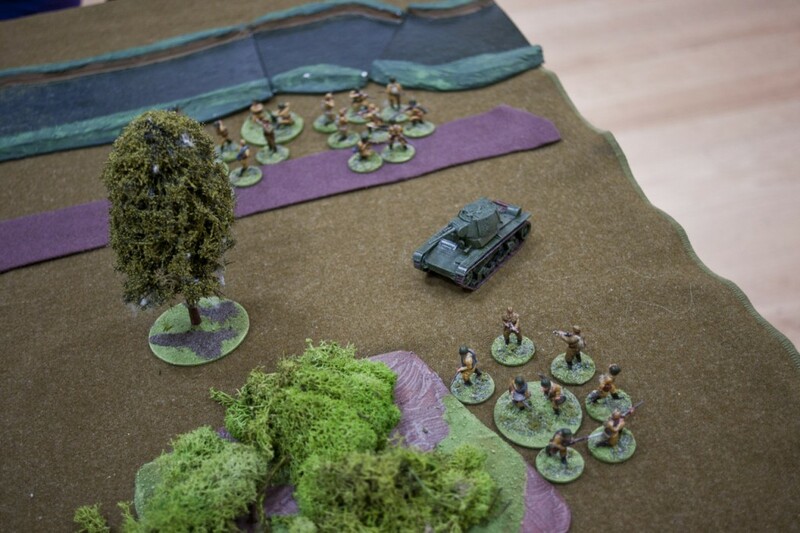 Mission specific: Everything past the road is classed as forest, this forest gives no movement penalty to moving infantry (would slow the game too much), Vehicles move at -1D6″. 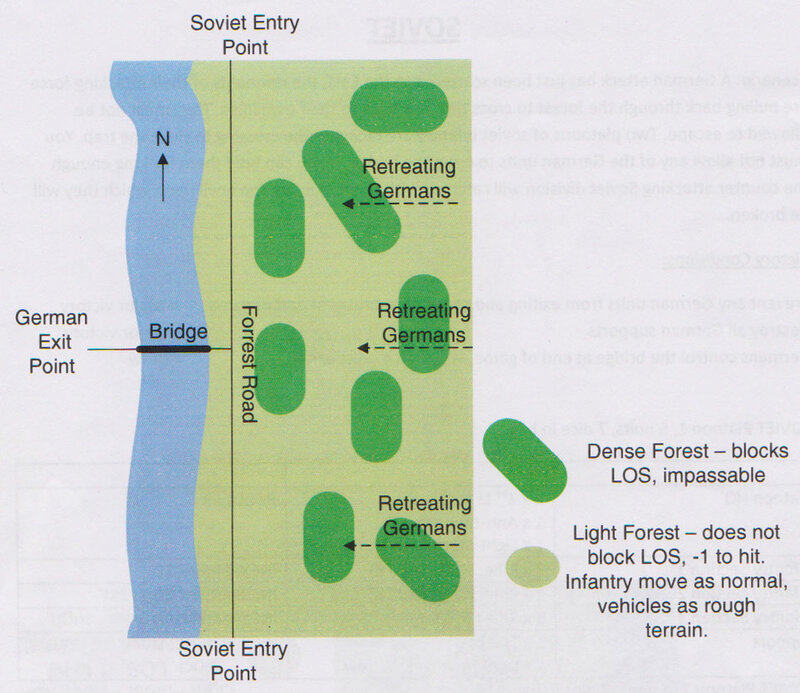 Dense Forest area is treated as impassible terrain, this is to show denser areas of woodland that neither vehicles or infantry will chance crossing while retreating at speed. 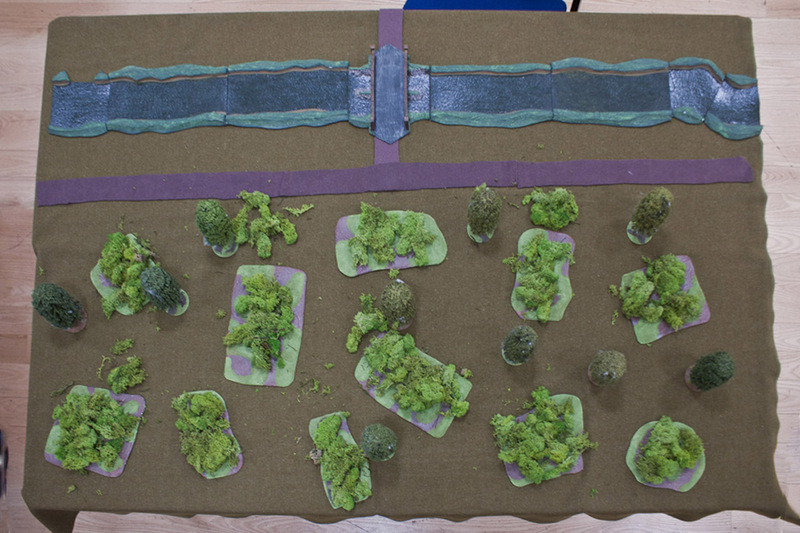 These could be anything from rocky outcrops, escarpments, areas of marshland, densely populated tree type areas etc. Normal WCG’s house rules: The “Dice of doom!” two extra orders dice are put in the bag, the first one to be pulled out is the “warning” that the turn could end. 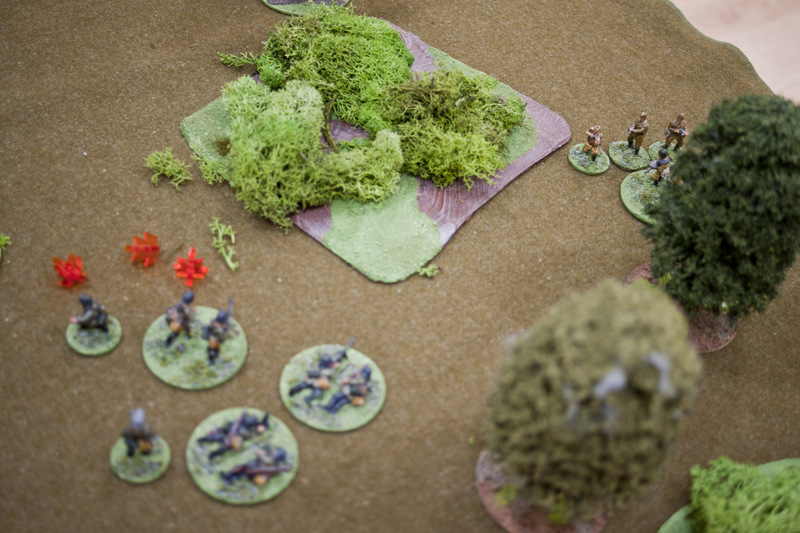 The second dice of doom ends the turn at that point. This could mean that some units on the table do not get an order this turn. Moral: when a unit is reduced to one man, he flees the table. He’s not considered an effective fighting unit and takes no furthur part in the game. Everything starts off table, turn 1 everything can freely move onto the table as a normal move. 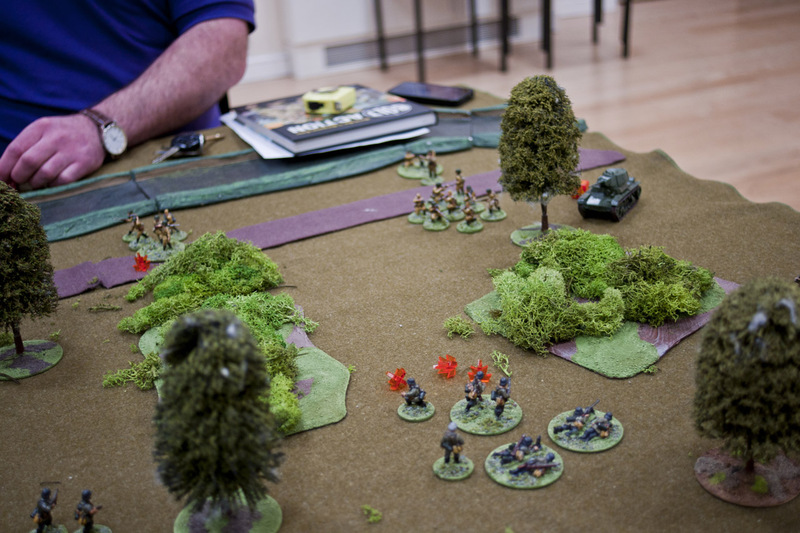 If turn 1 ends before all units come onto the table, remaining units must roll a leadership test to come on that turn. 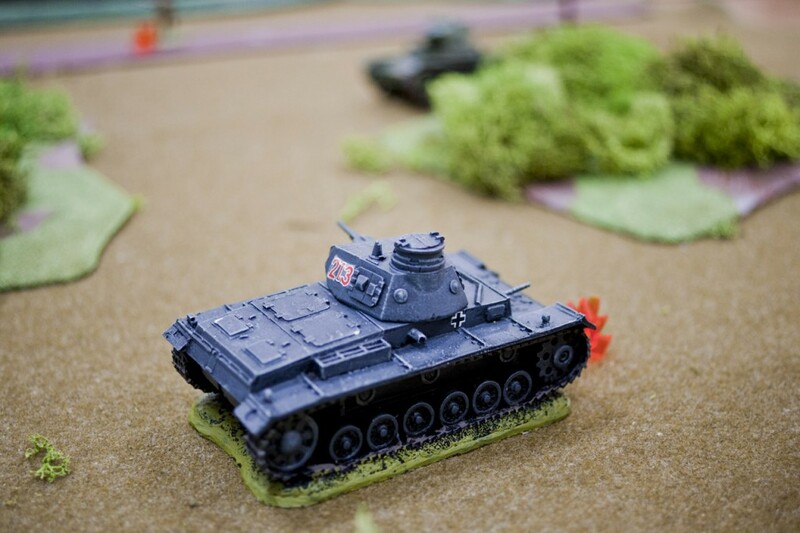 Panzer 3 moves on to support second unit. 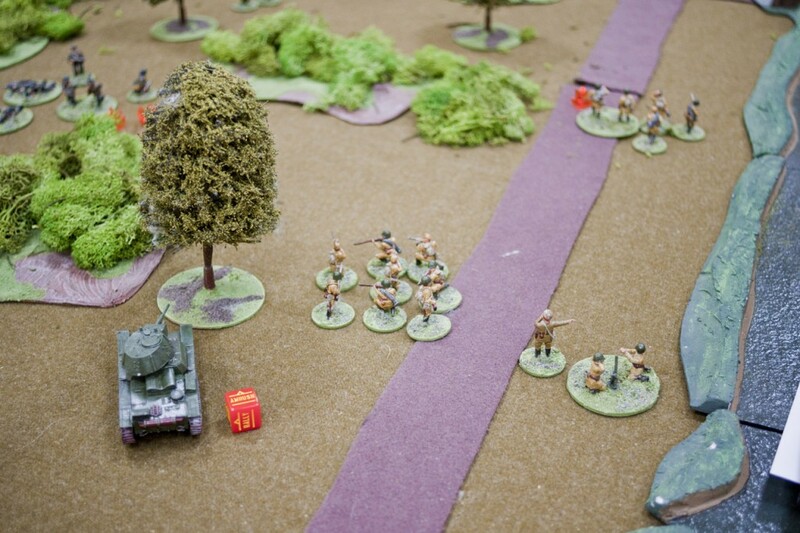 Brown soviets, infantry comes on (my left), aims at the freshest Germans, only the lmg can fire. Misses. 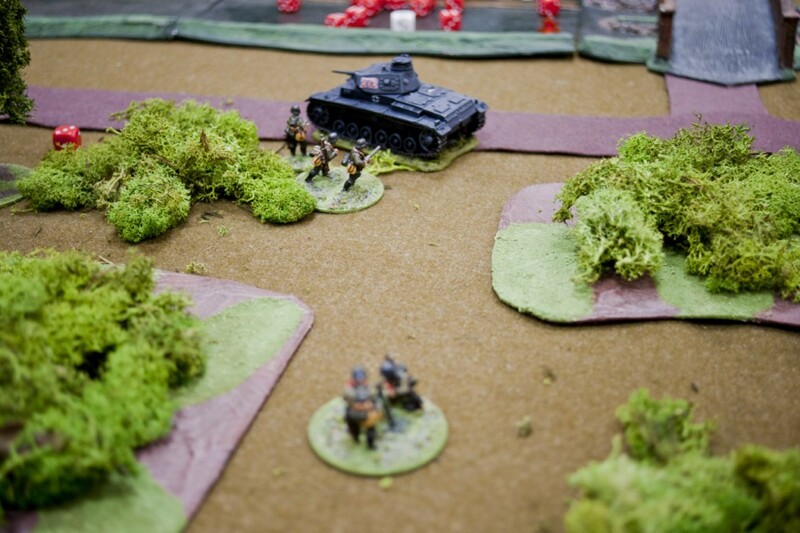 Red soviets, t26 moves on from right. Red soviets infantry moves on from the right. Brown soviet, light mortar moves on from left. 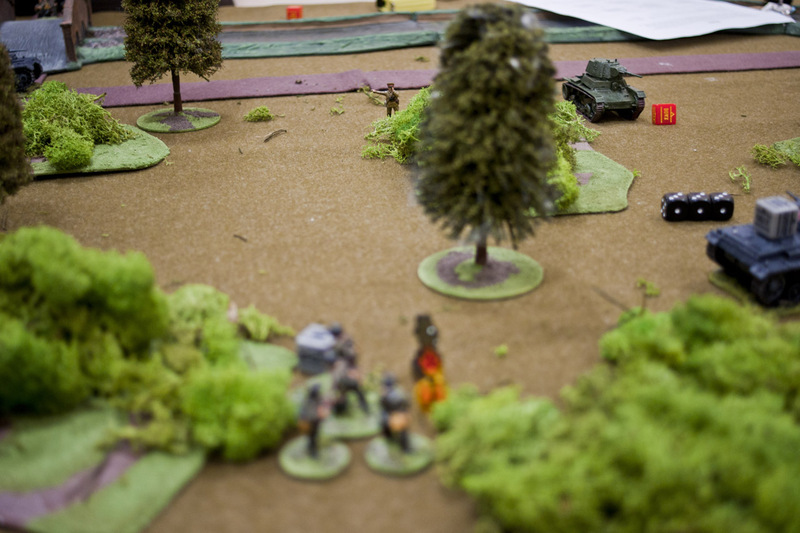 Moves behind unit that fired, shoots at unit at far side of board. Hits. One pin. One casualty. 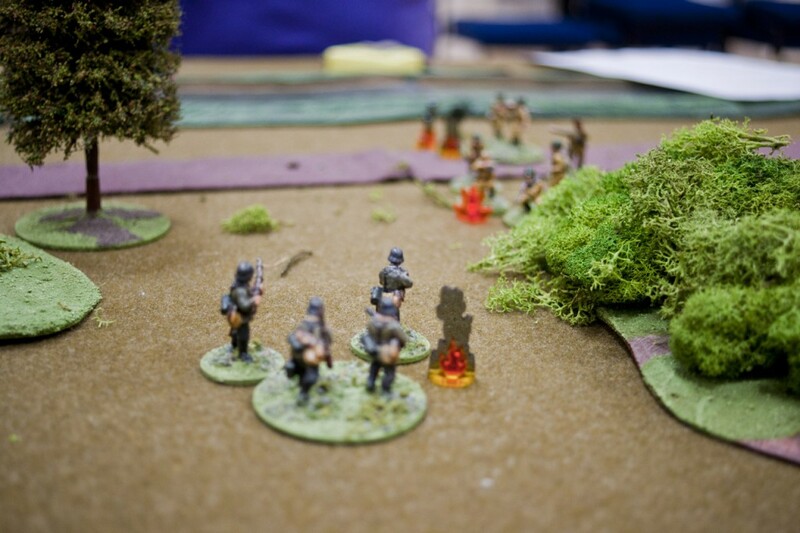 Brown soviets move on infantry on and into woods. 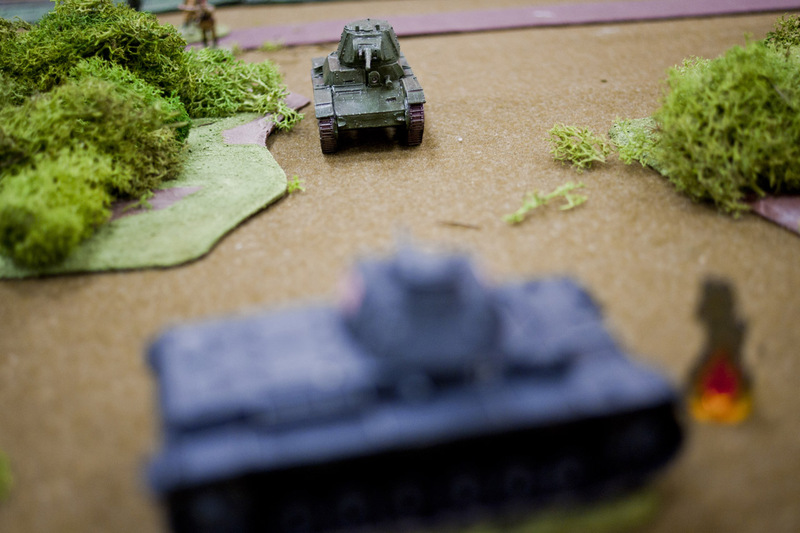 German panzer 3 runs forward. 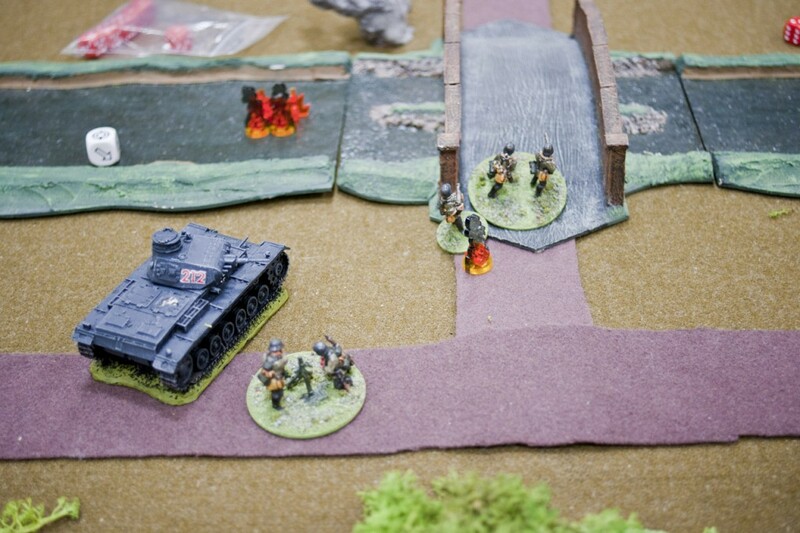 Red soviet infantry on right move toward the bridge. Black dice. Aims at mortar. Misses. Germans on far right run. 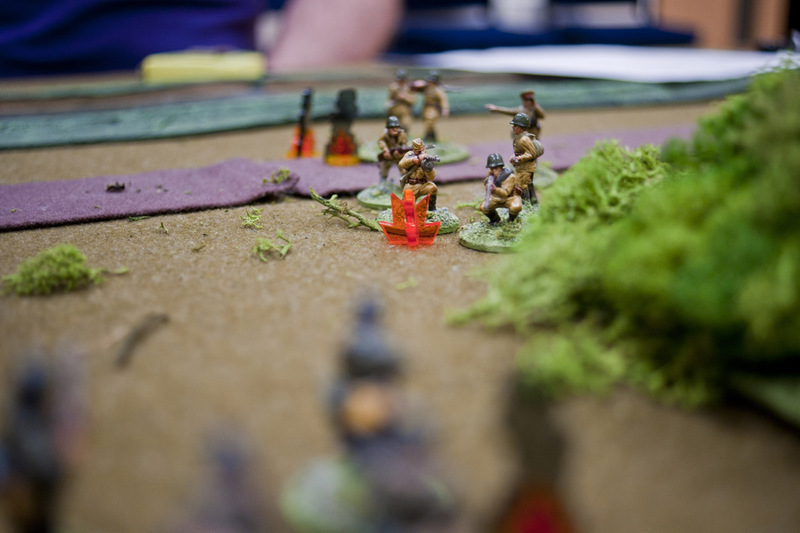 Browns advance infantry shoot at infantry who just shot. Hit and kill one. 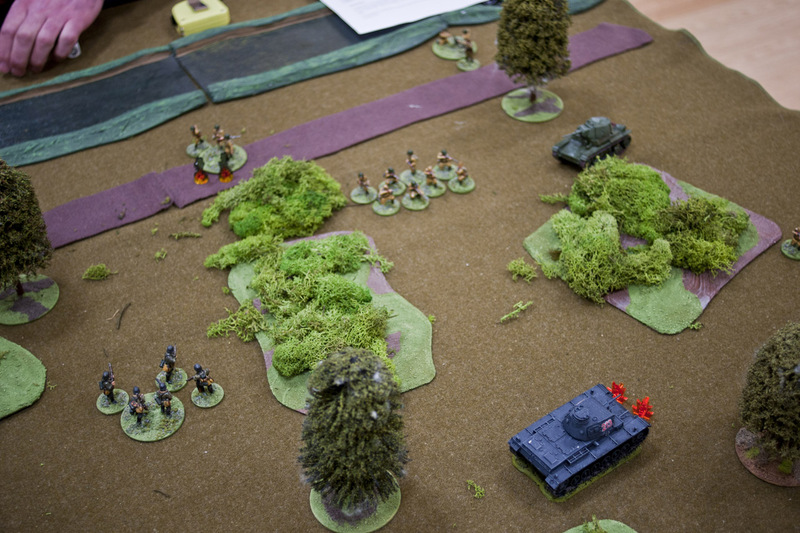 Reds advance infantry and shoot running Germans, one pin one dead. Browns, light mortar fires at same squad. Misses. 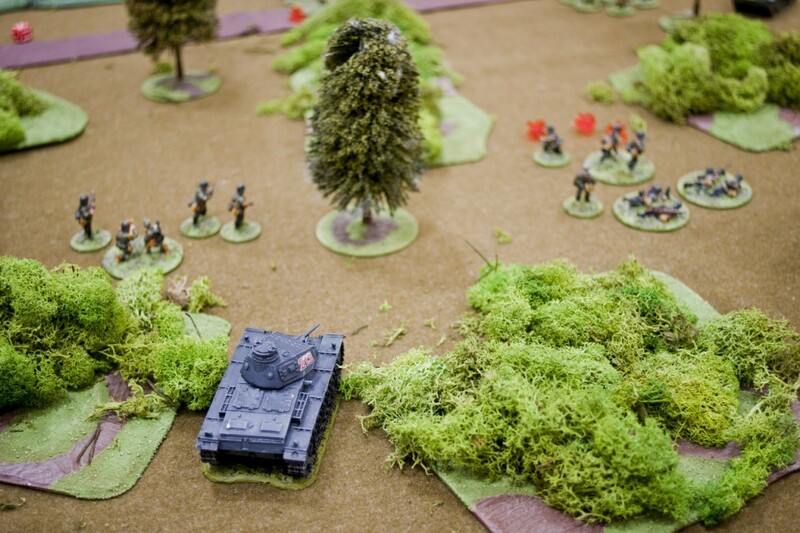 German squad moves forward, shoots at forward soviets. Causes one pin. German HQ runs to support Germans on far right. 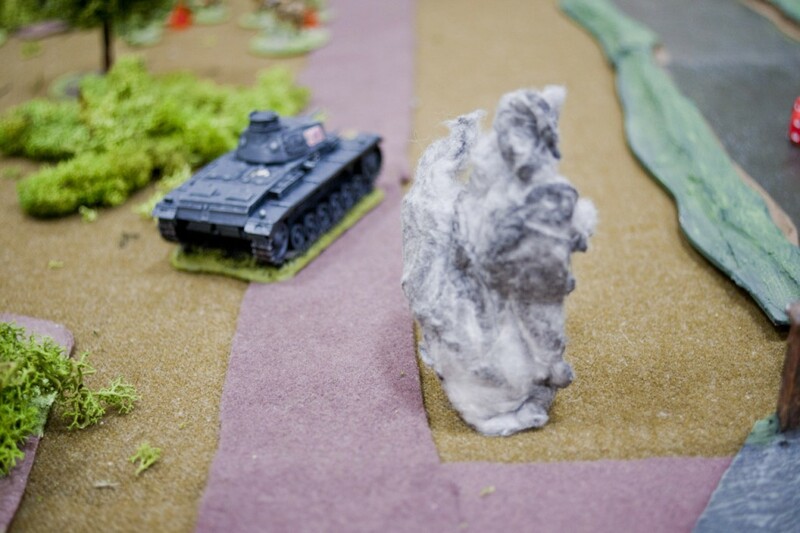 Panzer 3 goes on ambush. Browns on far left side with 2 pins decide to shoot. Pass their order, 7s to hit. Gets one hit. Kills him. 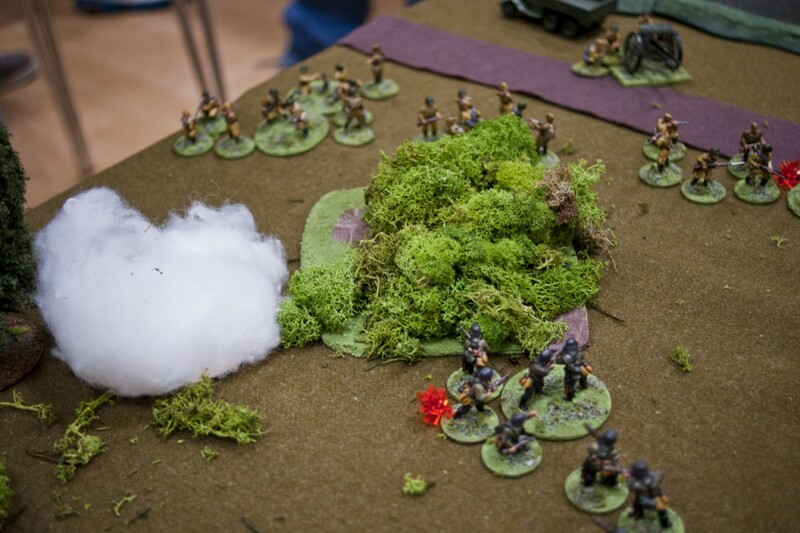 Reds light mortar fires at far right Germans. One pin. 3 kills!! Red last inf move, 7s to hit, kills one. 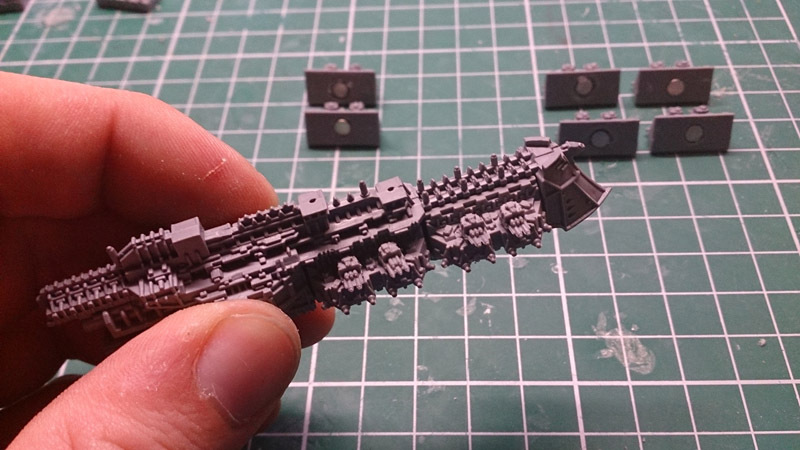 Panzer 3 advances 3 inches. 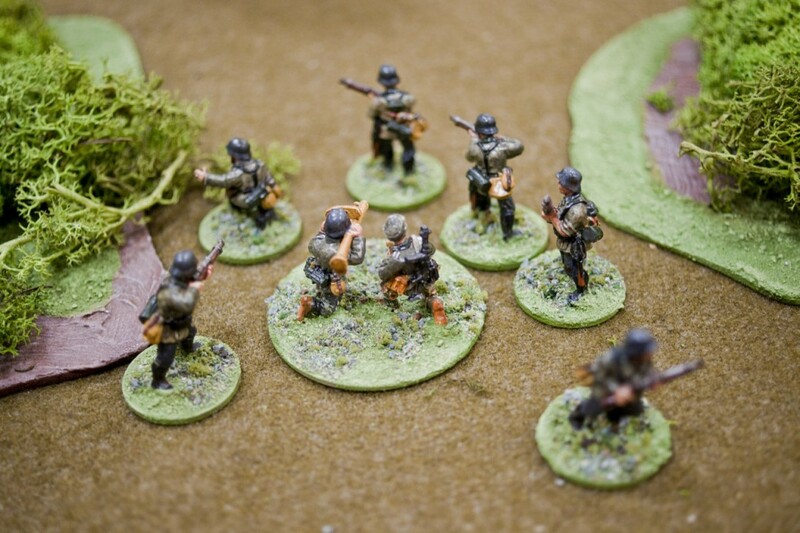 Browns shoot far back Germans, one hit. One kill. 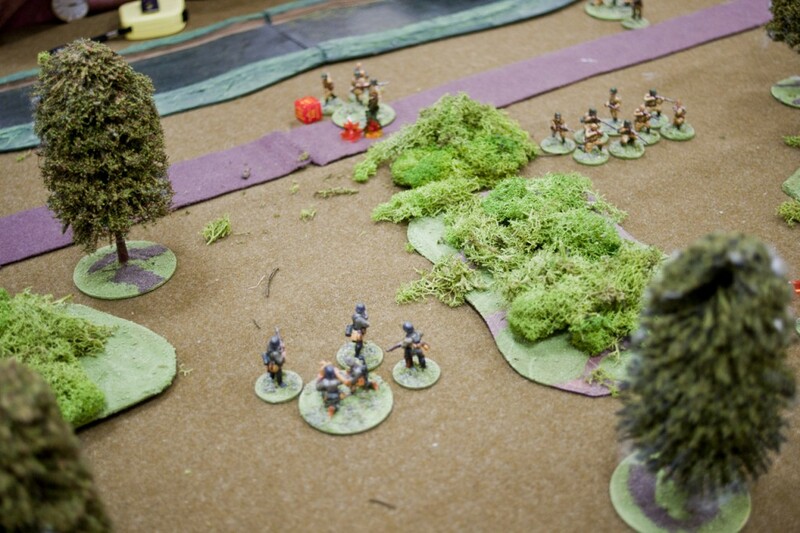 Herman unit in middle advances shoot and kill one. 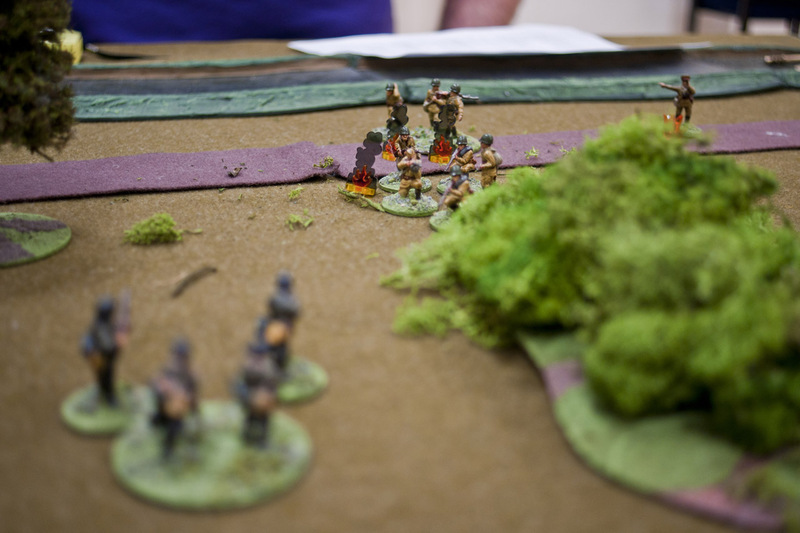 Browns, infantry go on ambush. 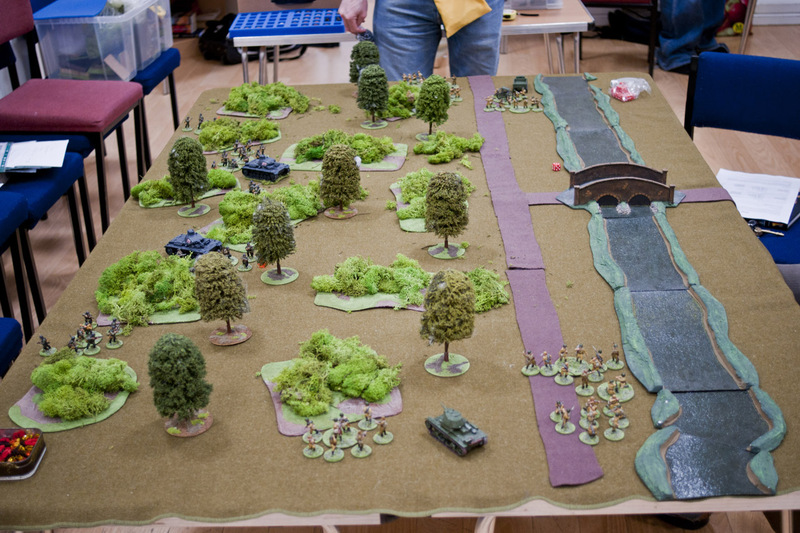 Germans advnc on left flank and shoot down reds. Kill one. Reds at far squad advance, shoot, 3 hits, no kills. German squad with 4 pins shoot. Pass order dice, miss the squad. Black dice. Shoots mortar. Hits. One pin. One crewman dead. 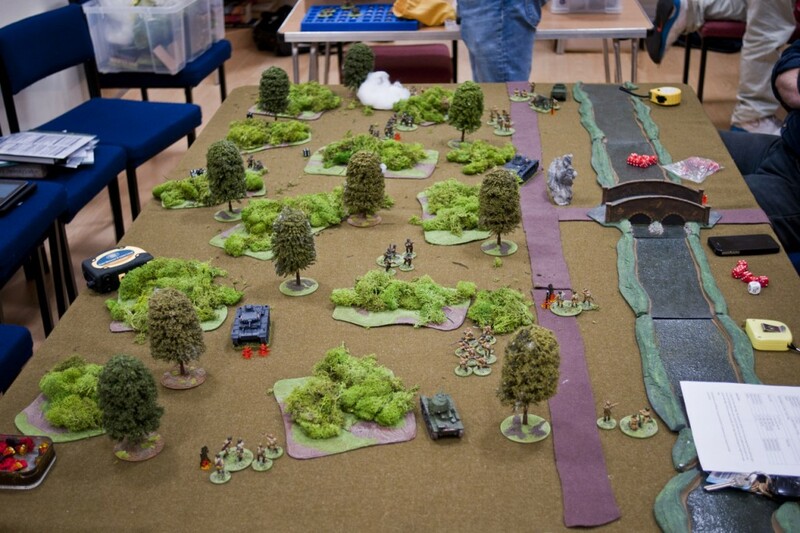 Reds try and shoot mg34. 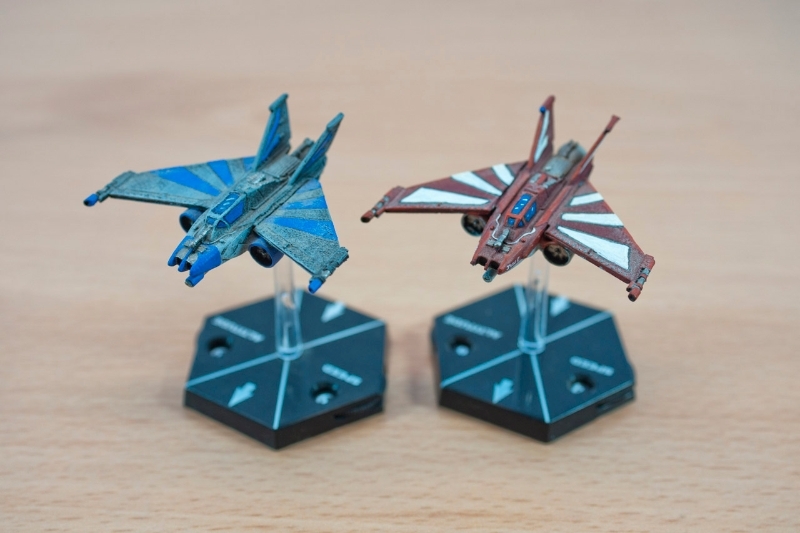 Fail order dice. Far reds shoot HQ. Go down. Kills two. HQ fails moral. Gone. Browns field gun shoots mg34, 2 pins, kills all of them. 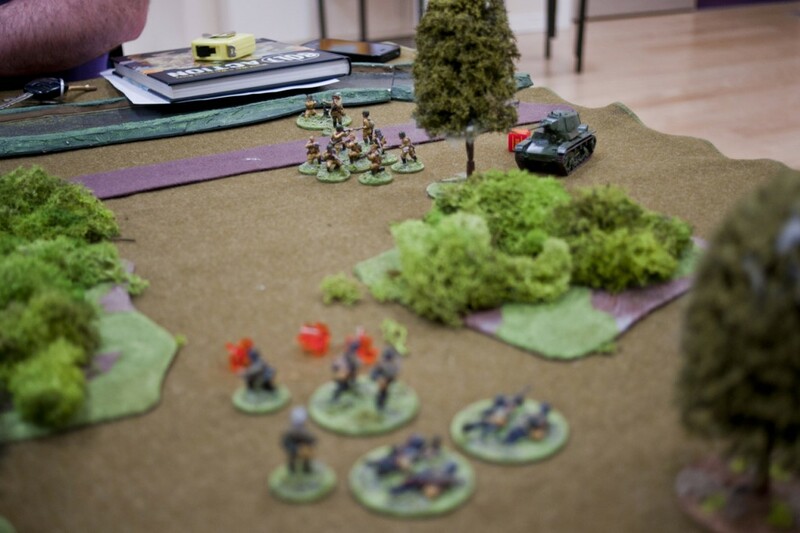 Reds infantry shoot the hammered Germans. Now on 4 pins, one dead. Browns, fire, fail moral. Go down. 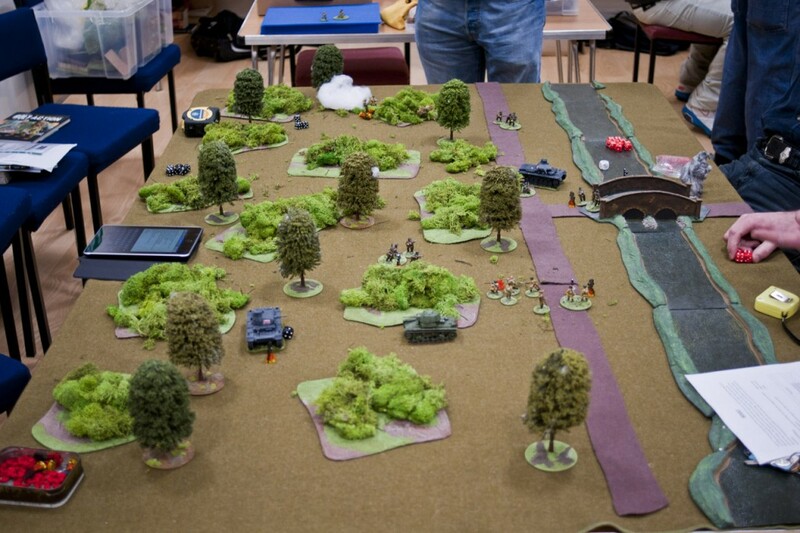 Panzer 3 advances. Kills 3 soviets!! Browns light mortar direct hit. One pin, one kill. Black. 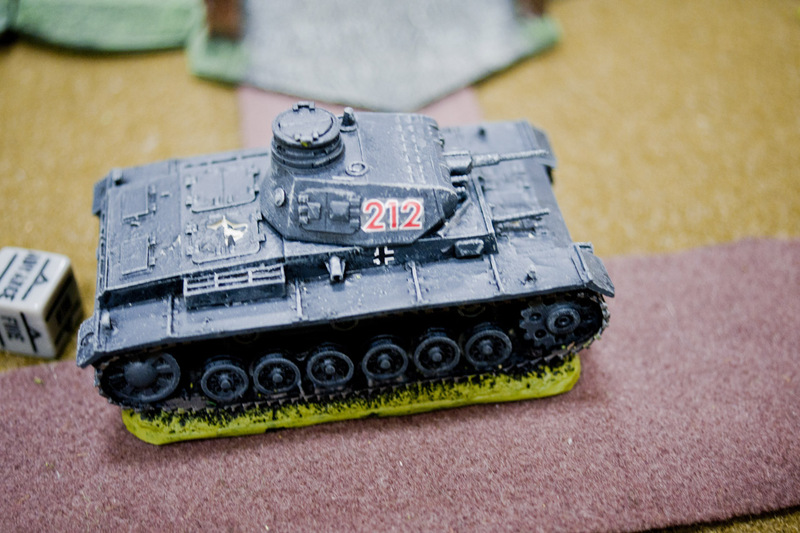 Hits panzer 3. No damage, butv2 pins. 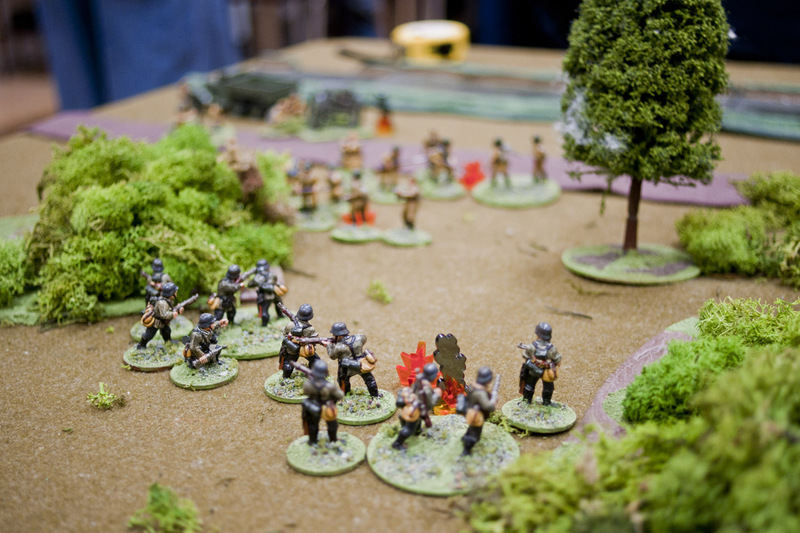 Germans in middle fire. One hit. One kill. Soviets on far side advance round cover. Shoot, one pin. 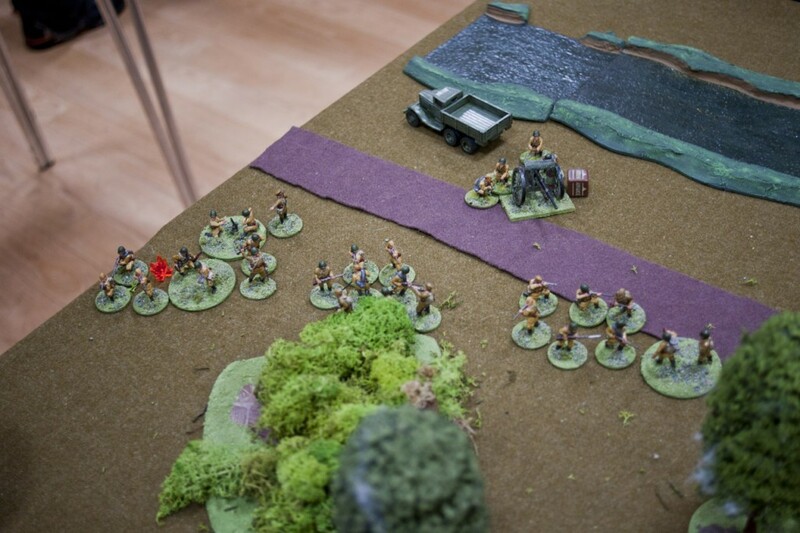 Other German unit tries to charge. Fails. 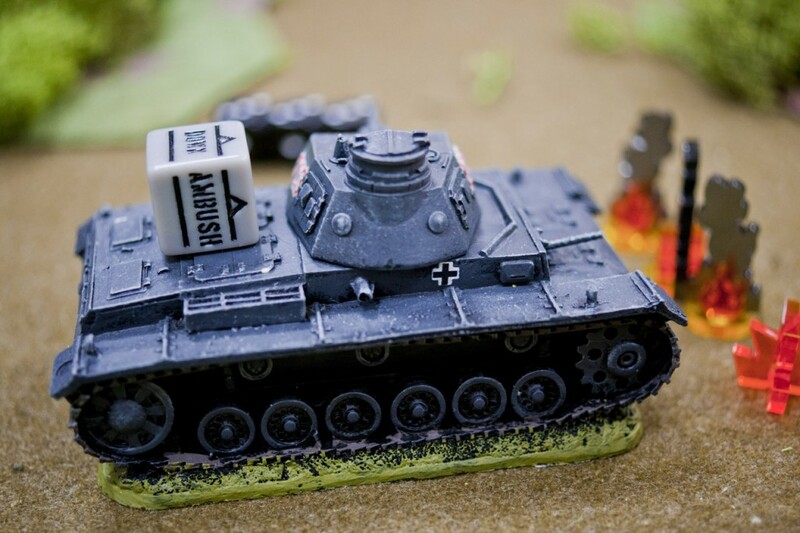 Panzer 3 fires. 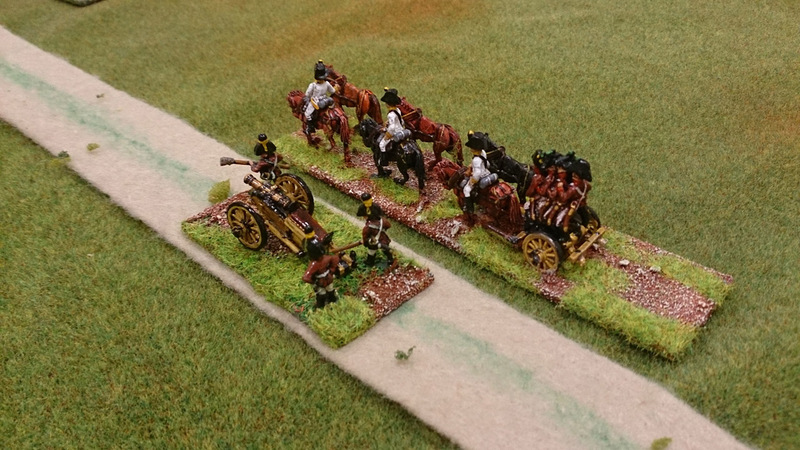 Splits 2 mmgs over the unit and the field gun. Pins the gun and kills three from the squad. Brown light mortar advances, shoots, misses. 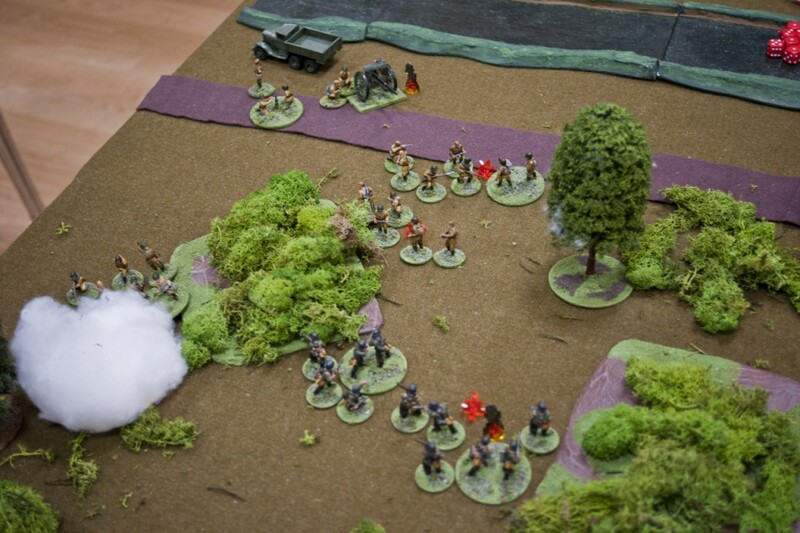 German unit fires, kills 3, fail moral. 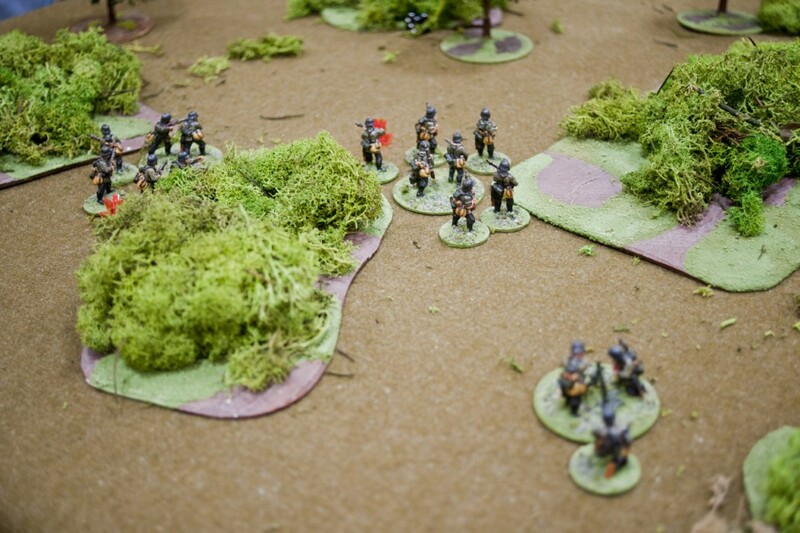 Seconds German unit advances. Kills one from far squad, now on 3 pins. 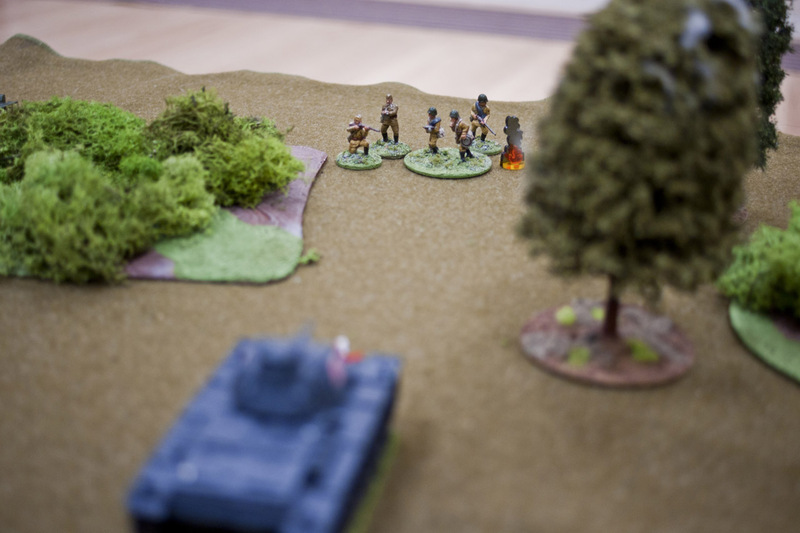 Panzer 3 shoots field gun kills one, and kills all of them. German squad runs into combat with light mortar and commander. Kills them all, loses one man. 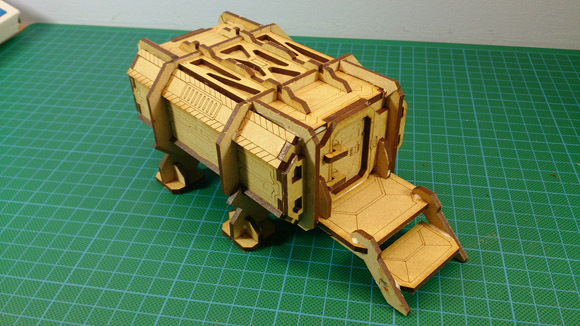 Consolidate into position next to the field gun. 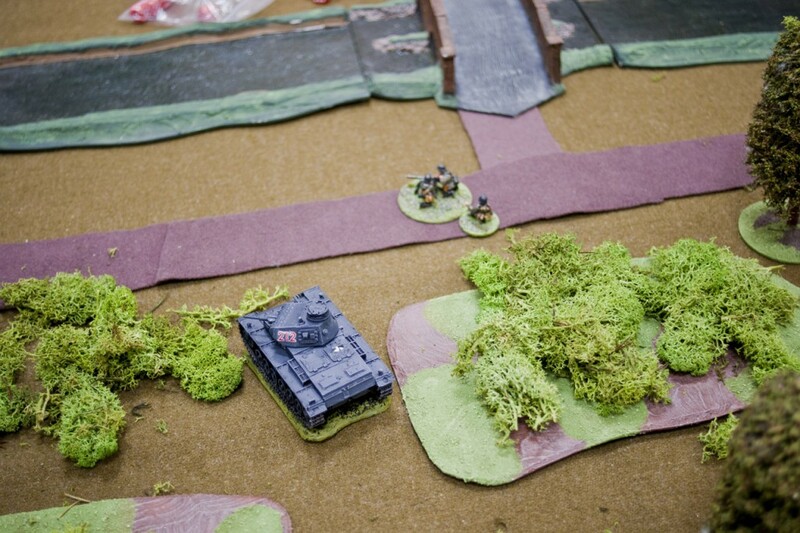 Panzer 3 on right splits fire, kills 3 in far squad, they fail moral and run away. Shoots at far squad, killed 2. Reds, lihjht mortar shoots squad, kills one and gives one pin. 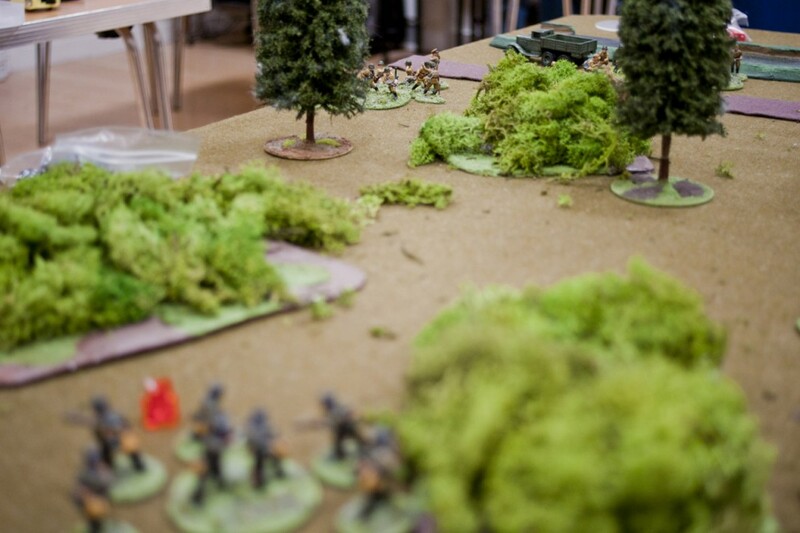 Reds squad that just got shot by panzer 3 advances round cover and shoot at Germans in the woods. No hits. 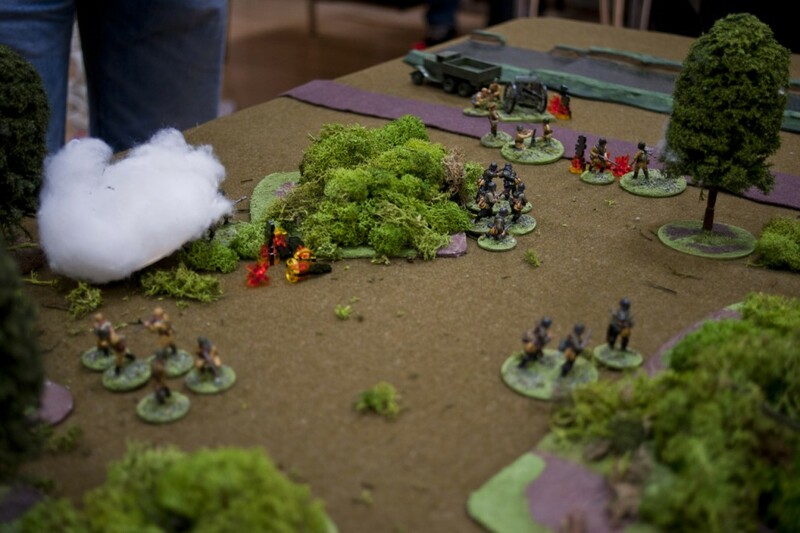 Germans return fire. One hit. One pin. One dead. 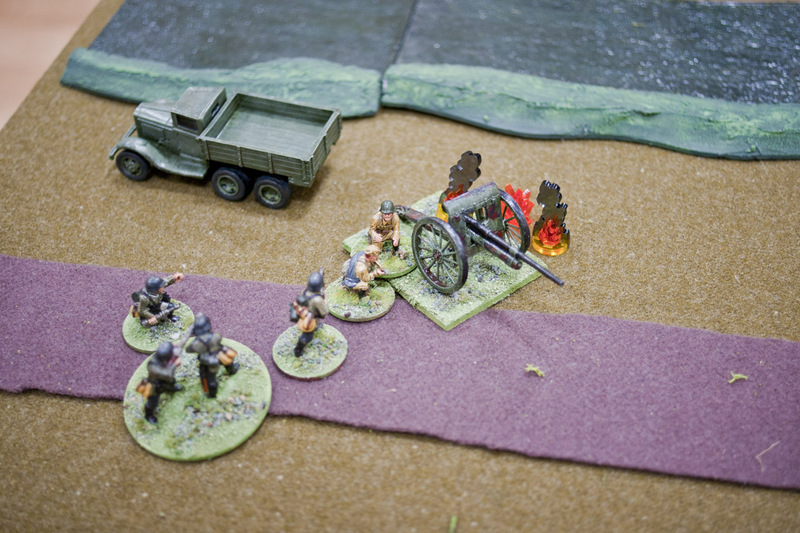 Browns, field gun tries to fire at tank. Fails order. Down. Browns, squad in smoke tries to rally. Fails. Down. 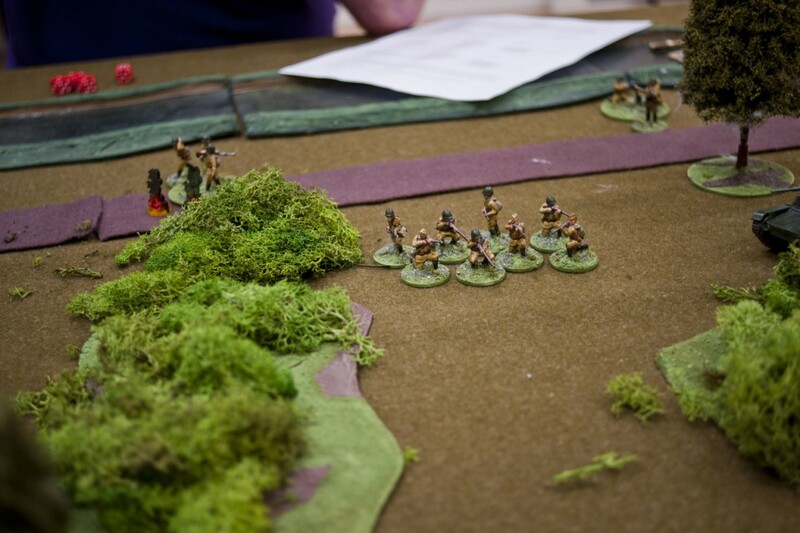 Reds infantry tries to fire. 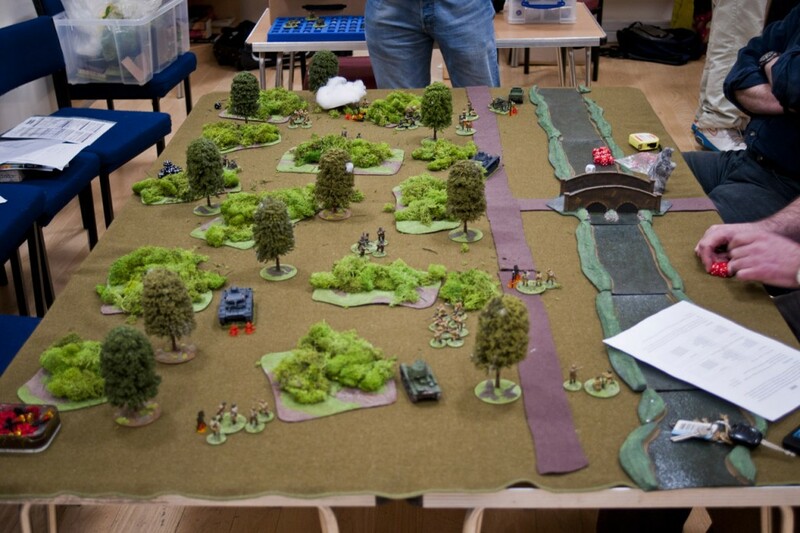 Fluffs it (double 6), friendly fire, turn round and shoots the light mortar, kills it! 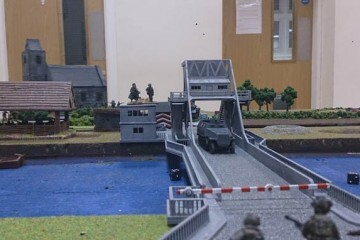 German squad gets to the bridge! Mortar runs onto the road. 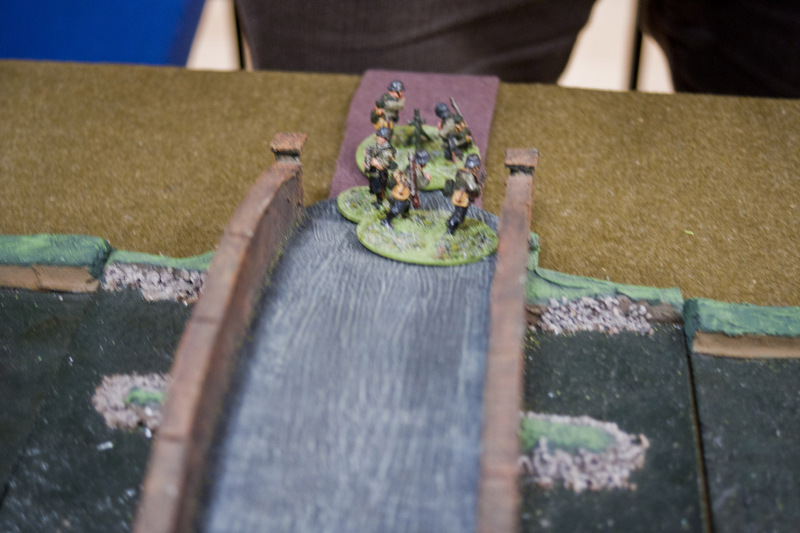 Reds small unit shoots squad on bridge, one pin. 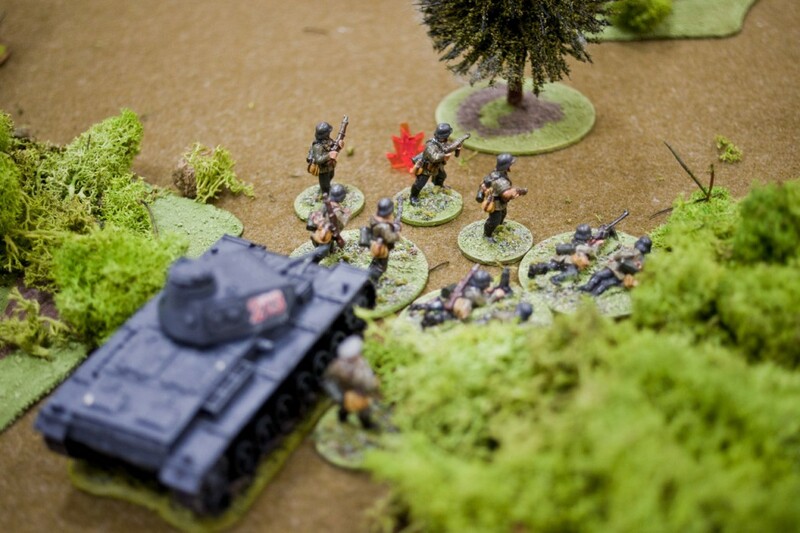 Panzer 3 advances, shoots infantry, kills one. 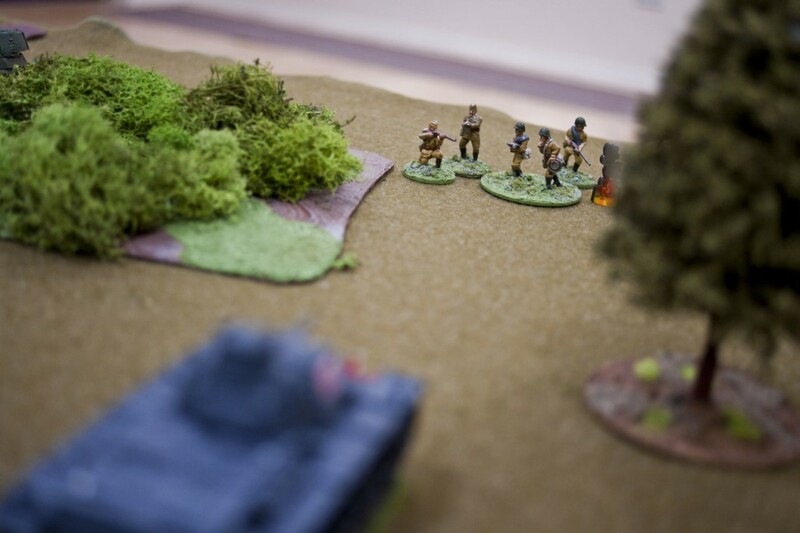 Reds t26 hits the panzer 3! Penetrates! Gets 3 higher. Rolls a 2 and a 1. Ends up with 4 pins, imobilized. 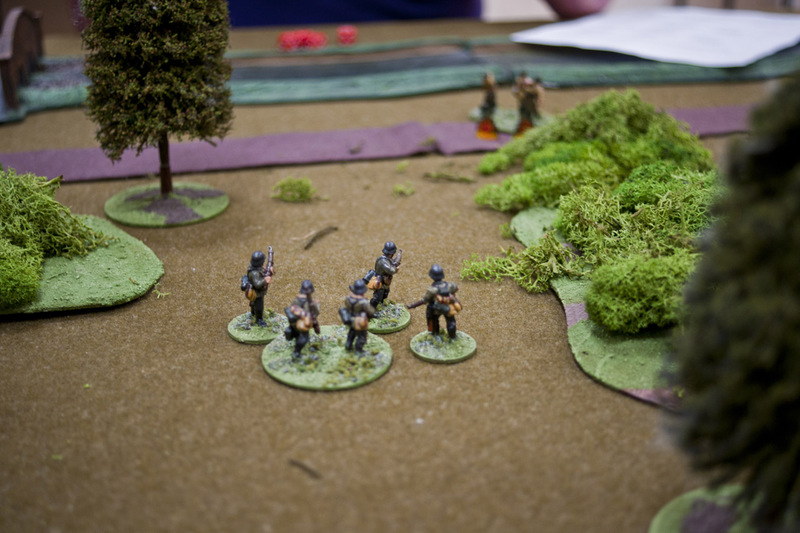 Reds infantry try to attack. Fluff it! Friendly fire! 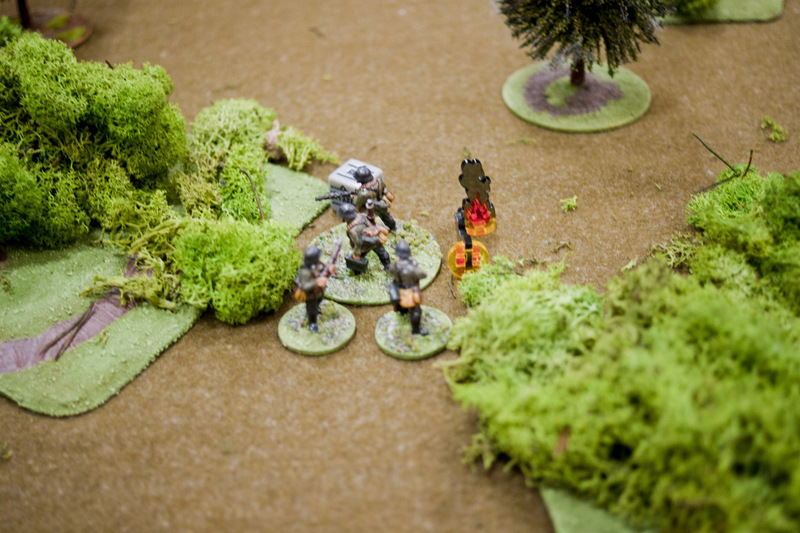 Shoot the lmg team, kill 1, which forces off the remaining man. 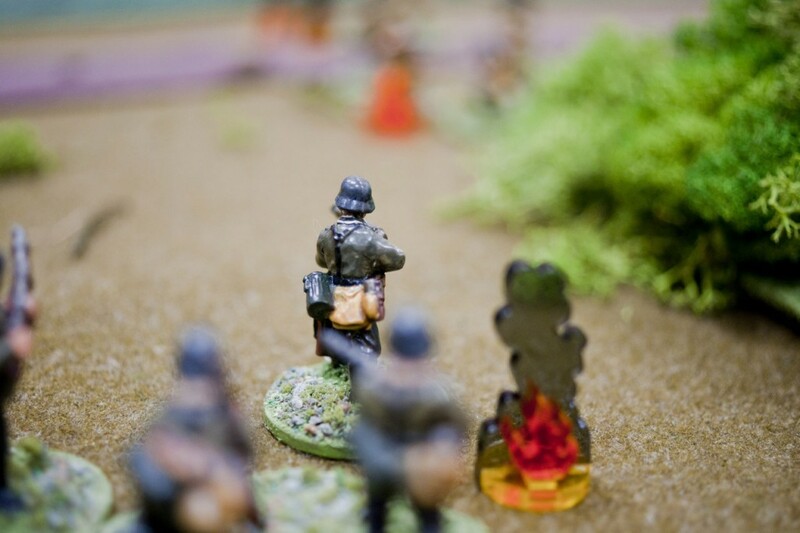 Reds commander advances to shoot German unit with his pistol. Hits, pins but no kills. Panzer 3 advances parallel to bridge shoots squad, wipes them out. Few dice cane out spare. 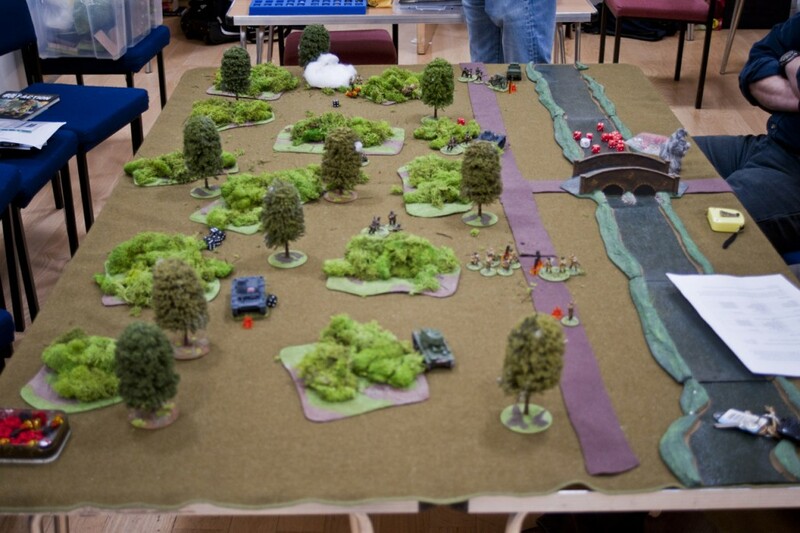 At the end of the game (ran out of time to play) the Germans held the bridge, and had three units on or near it, with a lot of the soviet forces destroyed. I hope you’ve enjoyed this post. Please feel comment below if you liked it.